Jorge Alberto Guajardo looks to the back of the courtroom while a witness is led in as opening testimony begins in his murder trial in the 398th state District Court at the Hidalgo County Courthouse on June 13, 2017, in Edinburg. Guajardo is the accused driver in the shooting death of Javier Olmedo in Donna in 2015. EDINBURG — Six months after a mistrial was declared in the 2015 shooting death of a Brownsville teen, jurors found a 25-year-old suspect in the case not guilty of murder early Thursday morning. Instead, they found Jorge Alberto Guajardo guilty of the lesser included offense of manslaughter. Though also acquitted of an attempted capital murder charge during the new trial which began earlier this month, the jury convicted Guajardo of deadly conduct and aggravated assault. The verdict comes nearly a year after Guajardo withdrew his guilty plea in January 2017. A judge at that time was preparing to sentence Guajardo to as many as 30 years in prison before the defendant decided to leave his fate in a jury’s hands. State District Judge Keno Vasquez declared a mistrial in June when a witness for the state admitted to commenting about her testimony on social media, violating a court order prohibiting witnesses from discussing the case. Guajardo once again found himself on trial this month for the Sept. 28, 2015, murder of 17-year-old Brownsville resident Javier Olmedo, who was shot to death while in a vehicle on Expressway 83 in Donna. Co-defendant Rolando Rene “Crash” Rodriguez pleaded guilty to murder, attempted capital murder of multiple people and two counts of attempted murder last January. As part of his plea deal, he was sentenced to a maximum of 35 years in prison. 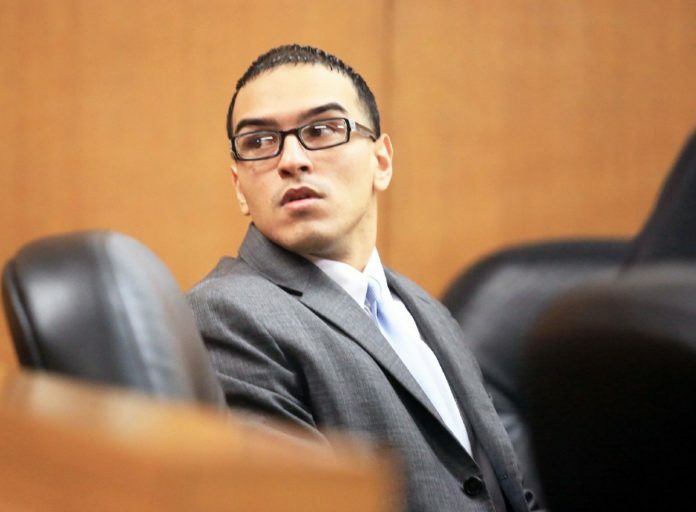 During his sentencing hearing, Rodriguez, 23, admitted to shooting at Olmedo’s vehicle multiple times but remained tight-lipped when the judge pressed him for details. Rodriguez, however, testified during Guajardo’s three-week trial that not only was Guajardo the driver of the vehicle but also responsible for discharging a firearm. Witnesses testified that both men are affiliated with the Tri-City Bombers gang and that the high-speed car chase and shooting occurred after a car carrying members of the South Side Bandidos, including Olmedo, drove by Rodriguez’s house.